Biographies attempt to concretize the life and achievements of individuals considered to have excelled and attained greatness in their chosen endeavours and have affected humanity in positive ways. A biography is a celebration of a purposeful existence, a document of history and posterity. A literary biography, however, does more than just romanticizing the achievements of an individual; it is an academic exercise that combines the precepts of literary and biographical criticism to investigate the life of a literary creative, his growth process, works, successes and challenges as well as his contribution to the literary tradition of his time. It is the scholarly approach adopted by literary biographers that distinguishes them from normal (ordinary) biographers. This uniqueness of biographical criticism as an academic endeavour has been creatively exemplified by Professor Sule Emmanuel Egya in his eulogy to one of Africa’s literary colossus, the astute poet and scholar, Professor Niyi Osundare. Egya, an accomplished novelist, poet, scholar, winner of the Commonwealth Prize (Africa Region, 2013) is a Professor of Literature and Cultural studies at Ibrahim Badamasi Babangida University, Lapai, Nigeria. 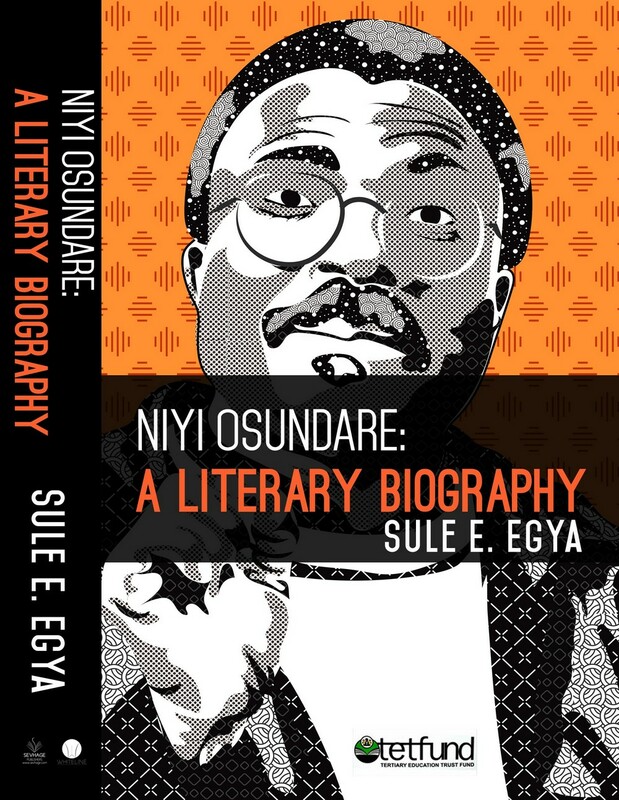 Niyi Osundare: A Literary Biography is a critique of the sage’s life starting from when he was born in 1947. The book is a grand inquiry into the life, successes and travails of one of Africa’s accomplished literary legends, the cerebral poet, social crusader and erudite Professor of Stylistics. The 334-page book which is divided into ten chapters is an x-ray of the life of a rural farm boy from Ikere-Ekiti who rose to international acclaim on the dosage of wisdom received on his father’s farm and whose creative texture is drawn from the memory of his childhood interaction with nature and rural life. According to Egya in the preface to the book, his research and writing of the work does not extend beyond 2014. He says in the book that his motivation for writing the biography was his attraction to Osundare’s poetry. “He was a poet I read and liked in my pre-university days, a poet I am not tired of reading. It might be worth mentioning here that my choice of poetry as an area of interest in literary scholarship early in my career was informed by his poetry, among others. I therefore felt immense joy when I contacted him and he agreed to support me with contacts, interviews and other materials,” Egya writes. The narrator takes the reader on a series of journeys into the poet’s childhood experiences, highlighting the significant moments that defined his path to glory such as the myth of the Osun River believed to have been the spring of life. In connecting Osundare to the river goddess (“The new boy was called Olomi, one whose essence is water, in honour of the goddess Osun whose gift the boy was believed to be.”) (p.6), Egya pays reverence to the biographee’s source of being as a symbol of Osundare’s belief in the tradition of his folks. The allusion to the goddess as a divinity worshipped by the people of Ikere-Ekiti readily calls to mind the similarity between Greek mythology and the Yoruba mythology, particularly their unflinching belief in gods. The myth of the Osun goddess and her spiritual import permeates the narration and its functionality cannot be easily lost on the clever reader. For example, the author writes that “Niyi, as a child of water, was barred from swimming as he grew up for fear the river spirit might decide to take back her gift. Fasimia would again invoke Osun later in her life when Hurricane Katrina in New Orleans almost took the life of her son.” The goddess is thus seen as God, both by the author and the subject of the work. There is hardly any conscious reference to the Christian God in the work dominated by the image and presence of Osun. It is important to note that both Egya and Osundare do not profess to the European religion of Christianity, hence the special attention goddess Osun enjoys in the work. The reader encounters in the book a glowing citation of the poet’s exceptionally brilliant academic exploits from elementary to secondary school and at the University of Ibadan. The poet, the author informs his readers, graduated with one of the best results at Amoye Grammar School and went on to achieve the same feat at Christ School. Osundare graduated in the second class upper division from UI. The author balances his narration, presenting the reader with the strengths and the weaknesses of the subject of his narration. We read, for example: “From 1964 to 1966, the graduation year, Osundare led the class in all exams, winning eight out of the nine academic prizes plus the General Proficiency Award in 1965. However, his weakest subject was Mathematics, in which he was barely average.”(P.39). The book also draws its worth from the author’s critical and scholastic disposition to literary trends and this is manifested in his submission on the philosophical premise of the second generation of Nigerian poets. He opines that Tanure Ojaide and Odia Ofeimun have been published and have registered their presence in the literary space before the emergence of Osundare’s first work, but that it was Osundare who defined the literary precept of the second generation of Nigerian poetry. He submits that “…it can be argued that Songs of the Marketplace, Osundare’s first title, drew more attention to the new phenomenon announced by Ojaide and Ofeimun. In their poetic praxis, Ojaide and Ofeimun sought to distance themselves from the existing tradition of Nigerian poetry in English characterized by turgid metaphors and quasi-private engagement, a result of the influences of Euro-American high culture.” (p.84). And on the Marxist disposition of Osundare, the author notes that the poet exhibited early signs of one poised for the cause of altruism even as a young man who at the verge of entering the university had three offers of scholarships; one from Amoye Grammar School, Christ School and the Federal Government. Of the three, the federal government scholarship was the most enticing but he declined it and that of Amoye Grammar School, opting instead for the one offered by Christ School. According to the author, Osundare’s decision to accept only one of the three scholarships stems from the fact that it was morally wrong for him to enjoy more than a single scholarship where one sufficed to cater for his academic dream. “Osundare declined the federal scholarship. In his judgment, it would be fraudulent to enjoy the two scholarships at the same time.” (p.63). He goes on to eulogize Osundare’s moral virtues and impeccable character as well as his battles with the various governments that continue to mislead the country. According to the author, Osundare wrote several critical polemics on the affairs of the state, critiquing and proffering solutions on how successive governments could serve the humanistic purposes of bettering the life of the common man. Osundare refused to take a federal appointment; his life was serially threatened and he survived a murder attempt which sent him into coma. Despite these daunting travails, Osundare remains steadfast to his cause of speaking for the voiceless against a system that cripples its present and future. The author recounts Osundare’s postulation on the status of Sefi Atta and Chimamanda Ngozi Adichie in Nigerian literature. According to the author, Osundare believes that Sefi Atta is an unsung writer while Adichie is over-exposed and overhyped. The author quotes Osundare: “Adichie has to watch out for the dangers of over-packaging and overexposure (…). I cringe whenever I see Chimamanda on bill boards planted by disingenuous bureaucrats from the REBRAND NIGERIA section of the Ministry of information.” (p.266-267). The most heart-rending and emotionally stirring account in the work is the narration of the poet’s survival of Hurricane Katrina, an ugly episode in the poet’s life which is likely to induce a tear or two from the emotionally sensitive reader. The rending of this episode is as detailed as it is creative; it comes off as fiction. The story of a renowned global professor and his wife becoming unknown or unidentified persons in a refugee camp and denied relief material in the midst of refugees and relying on the alms offered by friends is psychologically traumatising. This account is found in the eighth chapter of the book. The book also touches on the poet’s scholarship, literary works and the contentions surrounding them. Egya ends the book by suggesting Osundare as the possible next Nobel laureate from Nigeria. It is rather an overambitious assertion considering the fact that there are other distinguished writers of African and Nigerian descent who are equally ripe for the glory of the Nobel Prize.